Taken in the Bragg Creek Natural Area in Alberta, Canada, Anne Elliot (annkelliot@Flickr) has submitted this lovely close-up of Vaccinium vitis-idaea or the mountain cranberry via the BPotD Flickr Pool (original image). Thank you Anne! Vaccinum vitis-idaea is a low-growing groundcover. It produces acidic, bright red berries high in tannins and anthocyanins (water soluble pigments found in the vacuole of plant cells). The fruits are packed with vitamins and minerals and were used by people living in northern climates as a remedy against scurvy and deficiencies in the wintertime. Vaccinum vitis-idaea is not commonly cultivated and is mostly picked wild. The berries can be preserved and are used in many edibles such as jams, wines, baked goods, sauces and more. Because of the tart flavour, they are not commonly eaten raw. The berries are also an important food source for bears, birds, and foxes in the autumn and winter months. 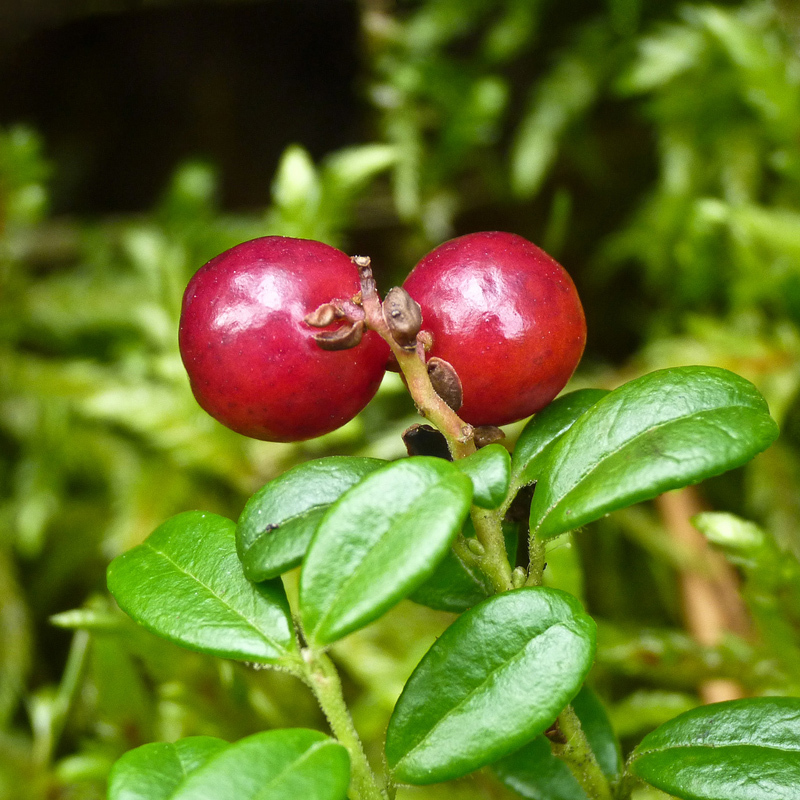 Most Vaccinium fruit is edible. Not all are palatable, but they are known to generally be edible. Some orchid hunters back in the 70s or maybe early 80s were studying the orchids on the Venezuelan tepuis, requiring a helicopter ride to get on/off the mountain. Due to a sudden storm that grounded the helicopter, a group was stranded on the tepui for several days with no extra food or water. However, there were vacciniums in fruit. After eating the fruits, people were actually getting worse, not better. Once the weather cleared and the helicopter rescued them, they discovered those particular vaccinium were one of the few poisonous ones. Ooops! If you ever get to Southeast Alaska, lowbush cranberries, blueberries, and salmonberries are some of the best parts of a hike! Though the bears love them all, too. Try lingonberry preserves on pancakes, biscuits, waffles – OK – straight from the jar, too. Yum! Here in Sweden we do a very easy but very tasty jam by mixing berries and the sugar slowly stirring as you go until the sugar is totally disolved. No cookng!7 deciliter of sugar and 1 kilo of berries. Pour into clean jars and try to keep them in a cool place. That will be hard as the jam is a true delight together the Swedish meatballs or other meat or as Melissa says direct from the jar!